I had the chance to see an early screening of Eating Animals, the documentary after the book by Jonathan Safran Foer. Apparently, Natalie Portman, who is the narrator of the documentary, turned vegan after reading Foer’s book. Together, they approached filmmaker Christopher Quinn, whose work they liked, and asked him to turn the book into a movie. Eating Animals will be out in theatres in North America in June, and later on Hulu; so, it seems that it could reach a pretty large audience. That would be well-deserved, as it is a beautiful movie. I think Eating Animals is one of the best food documentaries I’ve seen so far. As a seasoned vegan who is quite familiar with the issues, I had not expected to see or hear much that was new. But the documentary managed to surprise me, and offers more than just another catalogue of animal agriculture-related problems. For one thing, it gives us some history of how intensive animal farming came into existence and explains how corporations like Tyson came to be. And, it also tells us stories of people caring – in different ways – for and about animals. It tells these stories very well, and with a lot of heart. One of these is the story of veterinarian and scientist James Keen, who worked at the U.S. Meat Animal Research Center (USMARC), a huge livestock research facility in Nebraska, and became a whistle-blower after witnessing practices with animals he could not condone. Keen leaked the information to a journalist, which resulted in a long New York Times expose, which in turn led to a federal investigation, bills, and reforms. Eating Animals makes it very clear that all that Keen did he did at great expense to his own life and happiness. Keen had to move, and eventually saw his marriage break down under the pressure his whistle-blowing had created. It is hard not to admire the man for his courage and for following his conscience. There’s also the story of a contracted chicken farmer and his family. He testifies about how difficult that kind of life was, and how he felt a slave to the corporation that contracted him. We see him move through a huge barn of chickens, picking up the dead ones and showing to the camera the health problems they suffer from. While this man is or was instrumental in exploiting chickens, he was himself exploited. It is hard not to feel compassion towards him. 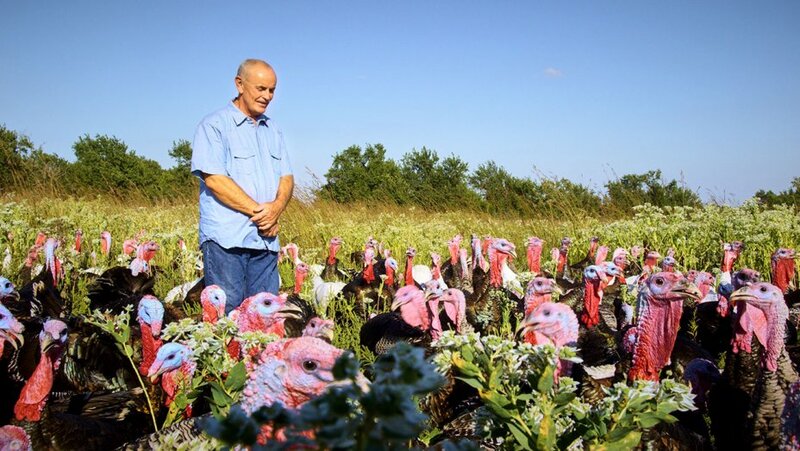 Finally, there’s turkey farmer Frank Reese, who already featured in Foer’s book. Frank tells us a lot about turkeys. He talks about how breeding and selecting the traditional Thanksgiving turkeys for meat has made them “stupider”, and how his breed of turkeys is a lot smarter. Actually, his goal is to keep certain old breeds of turkeys alive. And, if you want to keep them in existence, they have to be part of the food chain, he says. Now, me and most other vegans will not agree to this, obviously. First of all, I do think that, if we deem this important, we can keep breeds alive without the animals necessarily having to have a certain economic or food value (apart from animals in sanctuaries, there probably will have to be some value, but this value can be in terms of companionship or aesthetics). Secondly, why would one insist on keeping certain breeds alive in the first place? The extinction of a species can obviously have negative ecological consequences, and it may somehow look sad when a species goes extinct (particularly if it’s humans’ fault), but to me it is the individual welfare that matters, not the value of the species. Which is why I don’t always understand well-meaning efforts to reintroduce certain species of wildlife in an area, unless this would increase overall happiness and well being. The eventual fate of Frank’s turkeys is the same as all other turkeys: they end up in the slaughterhouse. It seems undeniable, however, that these birds have a much better life than the average turkey, and very probably also a better life than many or most animals in the wild. To many vegans these may seem like “welfarist” non-arguments. Any of these vegans, however, would, any day, choose to be a turkey with Frank above being your average turkey, and one has to be blind not to appreciate the difference this kind of life makes. More philosophically, I have lately started to think more and more about the question of whether being killed by humans negates all the happiness of an animal’s life that came before that moment. I know this is vegan heresy (but, then, I’m some sort of vegan heretic), and I plan to explore this question more in depth in another post. I don’t know the man personally, but it seems clear that Frank Reese cares for his turkeys (though not enough not to kill them – vegans might quickly add). I had the chance to have a drink with the director after the screening of the movie, and he told me that Frank finds the whole transportation and slaughtering process horrible, and is a great proponent of developing more humane ways of slaughter. You may get the impression from all this that the movie advocates happy meat. Certainly, it is not as unequivocally vegan or abolitionist as say Earthlings or Forks over Knives, but at no time did I get the impression that people would come away with the idea that it’s just a matter of switching to better meat, and that this better meat can be found in every supermarket. Indeed, the director told me that Frank’s turkeys cost 150 dollars per bird. The way Frank Reese raises his turkeys is exceptional, which is one of the reasons why Foer picked him out. 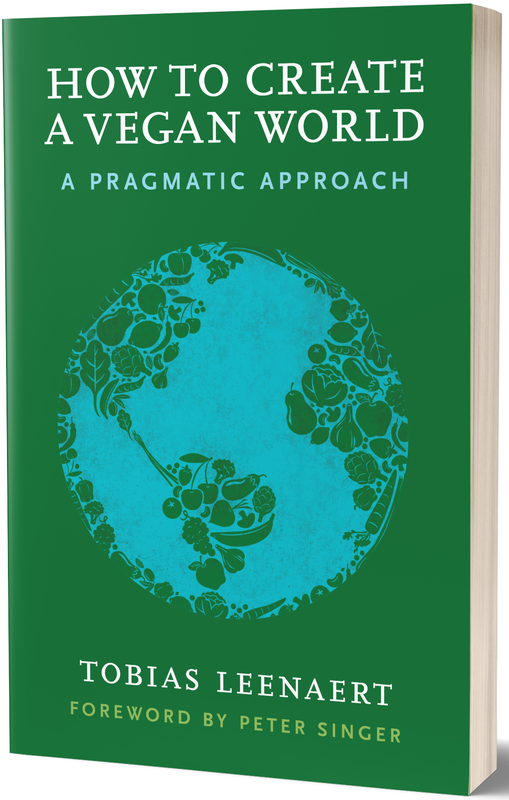 Also, the film includes several appearances by long time vegan activist Bruce Friedrich, presently CEO of the Good Food Institute. Bruce openly asks the question of whether we need to eat animals at all. The movie has some beautiful cinematography, with wonderful shots of agricultural landscapes and farms, and the scenes with Frank and his turkey’s are amazing – especially the final one. On the other hand, there’s a significant amount of graphic footage (most of it archival images) to swallow; so, be warned. If animals don’t dwell on the past or ponder the future, they have only the present. And, if their circumstances brought them to a present in which they suffer, then suffering is the totality of their existence. Thank you for the early update and looking forward to seeing it. My understanding was that Natalie Portman was vegan and then went back to vegetarian. Is she vegan again? Thanks so much Tobias. I especially love that you point out that the only thing that matters is the individual’s thriving. “Species” is a human construction, and doesn’t exist outside of our classifying minds. I strongly dislike Frank Reese already. Thank you for capturing that quote from the beginning of the film. It’s haunting and beautifully said and I wondered if it was from the book. I am not a vegan and do not intend to become one. Because of my husband’s knowledge of mass meat production, he and I are lucky enough to raise our own meat. Honestly, I shy away from meat not produced on our land for all the reasons highlighted in the film. My hope is that is movie creates an awareness about from where are meat comes. I hope it pressures the companies to become more transparent and the government agencies to become more accountable. If the public does not demand a different product then the companies will continue their practices. In addition, I hope that people slowly begin to change their eating habits to include less meat and more healthy options.